You can’t fault Visceral Games for their lack of ambition. Dead Space 2 won’t be available to scare the crap out of you until it hits stores on January 25, 2011, but the games executive producer has told Eurogamer that they already have plans for Dead Space 3. Of course, for a Dead Space 3 to become a reality, Dead Space 2 must first be a success. But judging on the effort EA (which owns developer Visceral) have put into the marketing and multiple properties developed for the series, including a Wii prequel, a comic and a anime movie called Dead Space: Downfall, Dead Space 2 would have to be a complete failure to kill the franchise. The series is EA’s take on the survival-horror genre, crossed with a sci-fi setting. The first game follows the amazingly unlucky engineer Isaac Clarke, as he and his team answer a distress call on the USG Ishimura, a “planet cracker” mining ship deep into a restricted sector of space. The rescue ship is damaged while docking, and the crew is forced to explore deep into the ship, and it soon becomes obvious that there is something horribly wrong aboard the Ishimura. Through the course of the game, Isaac discovers that the crew have been mutated into a race of monstrous Necromorphs, who want nothing more than to kill Isaac. 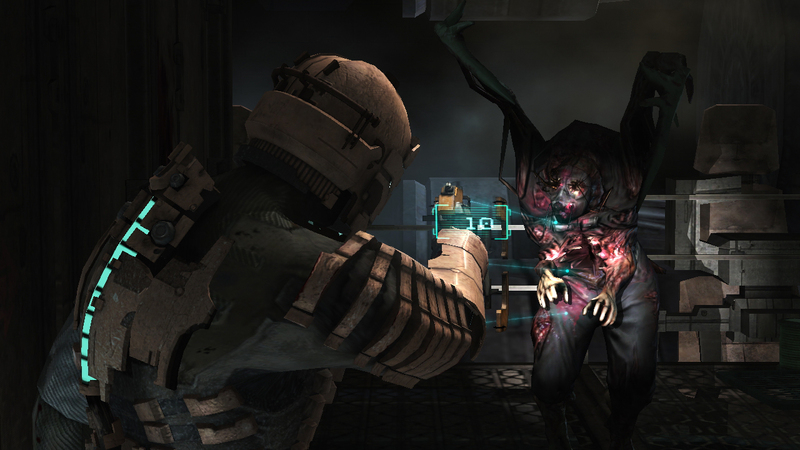 As he struggles to survive and complete objectives in order to escape the ship, Isaac begins to suffer dementia due to the “marker”, an alien artifact responsible for the outbreak. The sequel picks up in the massive space city the Sprawl following Isaac’s rescue, but the Necromorph infection has followed him, and he must again try to survive. Dead Space executive producer Steve Papoutsis has confirmed that the developer has mapped out a “huge timeline of events”, that it hopes to delve into for the third Dead Space game, and possibly many more. “We’ve mapped out where we’d like to go with it. Not at a super high level of detail. But, for instance, we’ve just released our novel, Martyr. We’ve talked about the inception of the Unitology religion. “We’ve thought about it all. But ultimately, just like with Dead Space 2, we have to have the support from the players in order to do it. “Hopefully the game comes out, people like it, it has critical support, and a lot of people buy it. And then we’ll get an opportunity to do another one. “Nobody’s going to just let you go and do another game just because. You have to have the people that are interested in it. “That was what was great about Dead Space 2. There was such an outpouring of support that it was easy for us to get the company behind it and give us the opportunity to make it. “Games are complex and expensive. It really helps when you’ve got a lot of people who are excited and supportive of what you’re doing. We can do great things when that happens. “But when there isn’t an outpouring of support it doesn’t make a lot of sense to do that. Dead Space 20 might have to wait, but Dead Space 2 is due out for the PC, PS3 and Xbox 360 on January 25, 2011.